The 8845A/8846A feature a unique dual display that allows you to measure two different parameters of the same signal from one test connection. To reveal signal quality issues like drift, intermittants and stability, view data as a real time trend plot or histogram, with the unique analyze mode. You wont find graphical display capabilities like these on any other instrument in this class. Choose from several interfaces to connect the 8845A/8846A to a personal computer: serial, IEEE-488, and Ethernet come standard on both models. A USB device port is included on the 8846A meter for convenient data transfer to and from a PC via a portable USB storage device. FlukeView Forms increases the power of your Fluke tool by enabling you to document, store and analyze individual readings or series of measurements, then convert them into professional-looking documents. Log live readings while connected to a PC or store, display and share readings in interactive forms, graphs and tables. Create customized, professional looking documents that can be printed or emailed. FlukeView Forms software includes easy-to-use standard forms. Instrument programming drivers, DLL files and support information are included to get your test system up and running as quickly as possible. The Fluke 8845A/8846A ship with a free copy of FlukeView Basic. Transfer data points from your meter to your PC and use the two standard, noncustomizable forms to display your readings in table or graphical form. For a larger array of forms or to use FlukeView Forms Designer to customize your forms, upgrade to FlukeView Forms version 3.0 with FVF-UG. 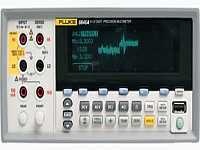 The 8845A/8846A emulate operation and programming commands of the Fluke 45 and Agilent 34401. Emulation shortens the learning curve and makes it easy to fit the 8845A or 8846A into existing test systems. Like all Fluke products, the 8845A/8846A are built to provide years of dependable service. However, if you do need calibration or repairs, you can turn to our global network of direct and representative service centers strategically located around the world. Each offers a full range of support services.